How do we empower rural women through tax justice policies? That’s what we at the Tax Justice Network were at the 62nd session of the UN Commission on the Status of Women to discuss recently at the UN Headquarters in New York City. This annual session is an opportunity for State delegations and other relevant governmental and non-governmental actors to comment on, discuss, and work on issues relating to the advancement of women’s rights globally. This year’s priority theme was ‘Challenges and opportunities in achieving gender equality and the empowerment of rural women and girls’. It’s the largest global gathering focused on gender equality. 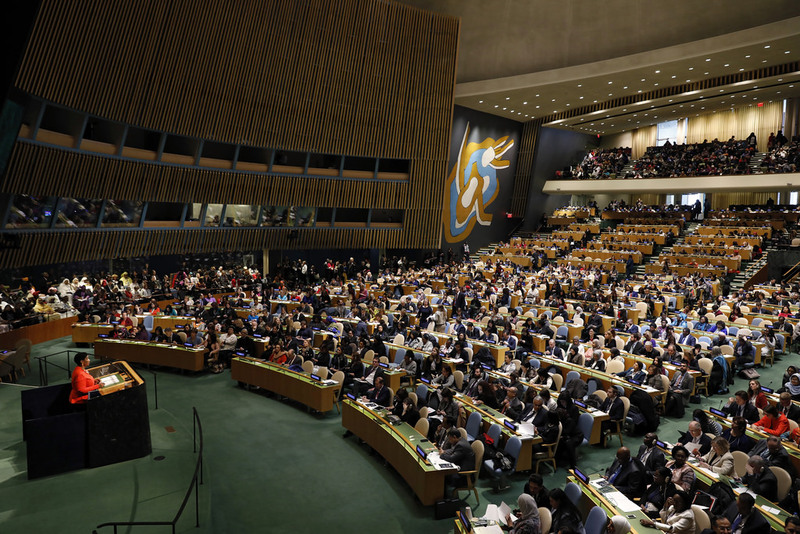 The 62nd session involved roughly 11,000 participants, over a hundred official side events hosted by governments, and over four hundred parallel events hosted by non-governmental organisations. The Tax Justice Network co-sponsored two parallel events. The first, “Tax and Gender Justice: Empowering rural women in mining-affected communities”, was also sponsored by the Global Alliance for Tax Justice (GATJ), Public Services International (PSI), Christian Aid, Center for Economic and Social Rights (CESR), and the Association for Women’s Rights in Development (AWID). The panel highlighted the experiences of activists and campaigners from Africa and South America in challenging both global macroeconomic structures and national policies that allow extractive companies to erode women’s rights through environmental degradation (rights to land, water), displacement (right to housing), profit shifting (less funding for provision of public services), and corporate capture of the state. So, how will women fare in this ‘corporate’ economy where corporate interests have captured states and their most effective economic re-distributive tools of taxation and tax policy making at the highest levels? This is the question tax justice and gender justice communities need to address. How will we tackle those forces which we consider to be so undermining for women? This is an emerging issue only just beginning to be understood by policy makers and influencers and linking macroeconomic policies to women’s rights seemed like a marginal concern within the broader gender rights discussion at UNCSW. Instead, policy advocacy efforts in the realm of economic policy focused mostly on microeconomic issues like financial inclusion, access to [micro]credit, and access to financial literacy education. At the macroeconomic level, the discussion centred on issues of [increased] female labour force participation and [freedom from] unpaid care work, often used as a kind of shorthand suggesting women’s economic empowerment. Substantively missing from this critical global gathering was discussion on the opportunities to extend literacy and analysis on the impacts of tax regimes (i.e. low corporate tax rates, joint filing of income taxes, VAT), international financial structures (i.e. trusts, secrecy jurisdictions, profit shifting) and tax evasion on the full realisation of women’s rights including economic empowerment. Wrongly, these concepts are seen as ‘far away’ from the grassroots reality of women. This is perhaps because the mechanisms and pathways of these impacts are deemed too complex by a broad swathe of women’s rights advocates as these concepts require a level of theoretical literacy that can be hard to communicate in orthodox models and language. Moreover, the ability to demystify these concepts is another way to dismantle the vested interests that want to keep this understanding out of the hands of women through exclusive language and use of jargon. The inclusion of illicit financial flows is a foot in the door for tax justice and gender justice advocates; it challenges state parties and requires them to question what is being lost (from the funding pot) and how. This can help bring tax justice in from the margins of the debate, but not without the tax justice movement doing more to build alliances at the grassroots levels in order to mainstream the idea and create better and simpler understandings of the complex and myriad ways that macroeconomics impacts women’s rights. These issues are key to how we discuss funding the realisation of rights. The document summarising the outcomes of the 62nd session of the UN Commission on the Status of Women makes reference to domestic resource mobilisation, official development assistance and very importantly, the need to combat illicit financial flows (s43). In the context of UNCSW, the inclusion of illicit financial flows is a big win and is a result of concerted hard work by a small group of macro-economic policy warriors. Responsibility for funding the realisation of rights is often couched in what can be positively realised in terms of domestic resource mobilisation and official development assistance. In other words, instead of looking at what’s being lost and could be utilised, the focus is often on how much money is coming in and can be made available to fund the realisation of rights. So, all eyes are on the 10 tax dollars coming in that can be used for development assistance, not on the 8 dollars being lost to tax evasion, illicit financial flows etc. We agree, and it’s what we, and many others have been advocating for many years. However, it is critical that we continue to build the capacity to hold these transnational corporations to account through more targeted advocacy and campaigning and leveraging international instruments such as the reporting structure of Convention on the Elimination of All Forms of Discrimination Against Women (CEDAW) to bring public pressure on them.